If I couldn’t have turkey for Thanksgiving, I might as well go to the beach, right? It was Wednesday afternoon, 4pm, and the weather in Guangzhou was a soupy, humid fog that occasionally turned to rain. It was a little hot, but I still wanted to wear a sweater, thanks to that foggy chill. I was working away—editing some challenging writing, trying to schedule reporting interviews, pitching some new stories, and trying to dig myself out of a hole of personal correspondence that I’d let lapse while getting settled. My desk, which is back to back with U’s, was cluttered with Chinese language books, cast off sweaters, empty Nescafe packets, and the kind of general chaos that develops when I spend to much time at my desk. Suddenly, U’s face poked into view on the left side of my monitor. “Hi. Want to go to the Philippines tonight?” he asked. He disappeared, and shortly afterward my Skype chat started squeaking with a series of links for flights between Guangzhou and Boracay at absurdly low prices, leaving either late Friday night … or that night. Moments later, we had tickets for 10:15pm that night. The rest of the afternoon, I spent checking off items on my task list and refreshing my email in anticipation of Wednesday-morning responses from writers, clients, or editors hoping to hand off responsibility before the holiday weekend. Nothing. The coast was clear. Everyone at the office was sticking around for the GZRuby meetup that night, so we all went out for a (sadly, super-salty) Dongbei dinner together. The meetup got underway around 7:30, and U wanted to catch the first part of it, so we stuck around. I threw some clothes into a bag with my computer and my Kindle, then anxiously checked my phone for the time. Around 8:15, a few of the other folks in the office helped me flag a taxi and pushed U out of the office toward the airport for our 10:15 flight. We arrived at the airport with little time to spare, as Cebu Pacific Airlines closes the gate and will issue no boarding passes an hour before the flight. When we tried to check in, it turned out we needed to have roundtrip tickets in order to enter the country; we’d bought one ways, since we needed to come back via Hong Kong. Oops. A mad dash between airline counters, in search of any fully refundable ticket that could be paid for by credit card, got us a flight booked with literally less than 2 minutes to spare. The ticket counter clerk kindly escorted us toward our check-in line and told us to ask to be pushed to the head of the line if we weren’t through immigration by 10pm. We barely made it through check-in. I had accidentally left a pocket knife—given to me by my (late) grandfather—in my bag and (tearfully) had to fill out a claim check form so I can pick it up when we get back. We convinced some friendly passengers (using broken French as a bridge between our languages and their Arabic) to let us cut the line, and as suggested got the line guard to pass us through the empty “special visitors” line. Then, we literally ran through the airport A gates to discover a gate change. Then, we ran back to our new gate, and arrived just in time to board the bus, board the flight, and buckle in for takeoff. U had the foresight to sleep, but I stayed up and read Flight Behavior instead. When we landed in Manila, we had a few hours to kill, so we worked in the airport for a bit (well, U did. I surfed Facebook, delighted to be in a firewall free zone where it actually loaded quickly, without a VPN or proxy! Woo!) before heading out to find some food at 2am. Our taxi driver kept suggesting 7-11 and McDonalds, but we persisted long enough to be taken to a just-closing-up fish market nearby. The restaurant was shuttering for the night, but they agreed to make us some food. They bought a few items from the last-to-go vendor across the market aisle. The meal unfortunately included a brief skirmish over overcharging us (by about 3X), but on the bright side, it also included a whole, vegetable-stuffed squid with a super delicious lemony-tasting, soy-looking sauce. We made it back to the airport (barely) in time for our next flight to Caticlan, and landed in the bright, early morning. A tricycle taxi to a ferry brought us to Boracay, and we shared another tricycle taxi with some German girls toward Bulabog Beach. In our sleep-deprived haze, we passed by several resort-looking hotels and restaurants, eventually landing at a clean, very basic two-story motel-style spot where we checked in, ordered massages in the room, and passed out for a few hours. When we woke up, we headed out to explore, and to sign up for some kitesurfing lessons. 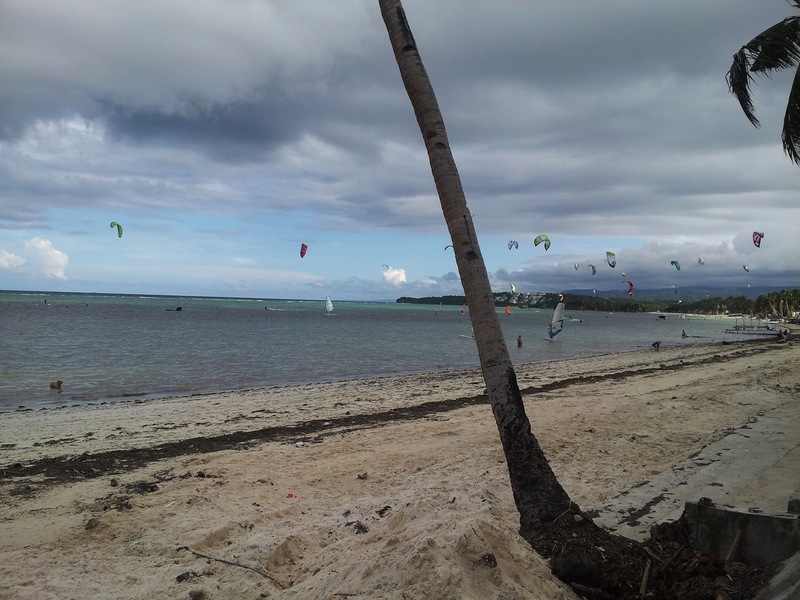 What To Do in Boracay: Kitesurf! Bulabog Beach is about a mile and a half long, on the opposite side of Boracay Island from the perhaps more famous White Beach (but still only a 15 minute walk away). When the wind is blowing, the entire view of the beach is filled with the brightly colored banners of kitesurfers, swooping like crazed birds of prey across the sky. I’d estimate that I’ve seen as many as 75 kites in the air at one time, but staff at the kiteboarding shops that line the beach says as many as 200 kiters share the ocean on the busiest days. The shore-lining palms are permanently tousled, with their fronds curled away from the beach. We signed up for lessons with Isla Kiteboarding on our first day, and our instructor, Along, spent a few minutes on the beach with us, learning to fly a small foil kite, so we could get the hang of it before handling a large kite. A foil kite has two lines — one to the right, one to the left — and a rectangular, double-layered “sail” in the middle, with vents that allow it to fill with air and rise up into the sky. The lines are joined to a bar at the bottom; to move the kite left, you pull down on the left-hand side of the bar while releasing the ride side up, as though steering a bicycle. To go right, you do the opposite. Managing this motion lets you figure out how to position the kite. From there, we moved on to the full kiteboarding regalia: harnesses, life vests/surf shirts, helmets, booties, and an inflatable kite. Our first lesson was fun, but the next day, we switched over to Hangin’ — the gear was a little less worn, the staff more German- and English-speaking (useful for learning), the rules a little more safety-conscious perhaps, and our hotel (which was affiliated with the school) got us a discount. We’ve taken four two-hour lessons, and we’ll probably get one more in before we leave; U is working on getting up on the board, and I’m optimistic I’ll do the same in the next lesson, though I’m not as successful at consistently steering the kite in the direction I want. Left-handed steering, in particular, is hard, and my mishaps often send me into spirals of re-launch, out-of-control dragging through the water to the left and then the right and then back, followed by a crash — or some variation, thereof. Our instructor, Josef, has been very helpful at redirecting me when I get into these spirals, but I’m not quite calm enough to do so on my own after a few terrifying rides at the hands of the kite and the wind. The kites are beautiful, and it’s been really fun to play with and learn about different sizes, different line-configurations, different shapes, and different brands. With changes in the wind, improving skills, and a variety of gear, every day feels different. The wind is incredibly powerful, and when you’re holding a kite up in the air, coaxing it right, coaxing it left, giving it power, lifting it up to the zenith to rest quietly, you can feel the wind as a thing in a way that’s thrilling. At night, I lay in bed, falling asleep, and instead of the rocking sensation after a day in the ocean, I feel the surging, rocking pull of the wind against my weight in the water. For work, I’ve covered dozens of stories about wind power technologies, and about wind power project developments, and about tools for evaluating wind in potential project sites, and thought a lot about wind as an energy resource. But to experience it with your hands and your body — to shape its power and give it direction and give it a job just for you is a different kettle of fish. The wind’s power, its here-and-then-gone nature, its gustiness, and the incredible, untamable might of it — I understand wind in a new, visceral way, even after just a few days of lessons. When I write about “intermittency” in stories from here on out, I’ll have a much better understanding of what exactly this means. For example, yesterday’s lessons were a breakthrough for U, and he was excited to get back out on the water today, to reinforce the skills he’d learned and get up on the board for longer stretches of time. And today, the wind decided not to show up. There’ve been a few kites out; beginners that haven’t needed to pull their bodyweight yet, or experts who have been coaxing movement out of the wind with large kites. Today, we sit and work, and wait. It’s not hard to work up an appetite after taming the wind while standing in the ocean for a few hours, and after our lessons, U and I have been showering up, doing a few hours of work and/or reading (we’re still us, after all), and then heading to White Beach for happy hour, dinner and socializing. The entire length of White Beach is shoulder-to-shoulder beach bars, diner buffets, live music, and massage shops. On the recommendation of some of the kitesurfers, we’re already becoming happy hour regulars at Bom Bom Room, one of the dozens of beachfront bars on White Beach. A red-green-and-yellow color scheme, and a popular house band that includes a few Bob Marley tunes in their repetoire are (thankfully) the only rasta elements of the bar, and the happy hour drinks are two-for-one tropical beach cocktails, priced at just 130 pesos (about $2). The seafood cooked in coco cream has fresh chunks of squid, tuna (or tuna-like) fish, whole shrimp, and vegetables. We’ve enjoyed two evenings on their cushioned benches, looking out over the water, though since happy hour lasts until 8pm, we’ve so far arrived too late to catch sunset. Maybe tonight! The next night, we chose one of the buffet, which was an efficient way to try a lot of different Filipino dishes, and then we wandered into a bar with a busy scene. We befriended a group of lesbians from Manila; they were arm wrestling at a table out front and quickly adopted us into their group. Talking, more drinks and dancing ensued; the next day, I discovered that kitesurfing with a hangover is much less fun than kitesurfing without a hangover. We were surprised to find that, in most of the restaurants we’ve patronized, the offerings are primarily Filipino, but paired with a substantial number of German dishes. The number of German-influenced, German-owned, German-patronized, and German-friendly businesses here is remarkable. We’ve even met a German au pair, here with a family that wants to ensure that their children grow up learning traditional Germany culture and German language, despite living part-time in paradise Boracay. Some reading about the island’s history points out that the first travel guide to the Philippines was published by a German, in German, in 1979, before being translated into English. So, maybe the Germans just “discovered” it first. Our first hotel (Boracay Kite Resort) was German-founded, and featured a VERY rudely named biergarten with pretty good German food on the menu (that’s according to U, who also suspects the original owner has since moved on.) The website images are a bit out of date — the bathroom door didn’t close in our room, and the towels were a bit ratty. We’ve since moved into the very nice Bale Mi at the same rate, two doors down. Here, the WiFi is fast, the room is pretty and airconditioned, it has energy and water-efficient fixtures, and it’s generally a nice setup for working. We priced/checked out a handful of rooms in other spots (mostly closer to White Beach), and I think we are getting a great deal, here. I would highly recommend this one based on our experience. Tomorrow, our plan is to find a new adventure on the largely undeveloped Carabao Island. We’re catching a ride with a local on his way home; although ferries are listed on various websites, they seem to all be operating in a legal grey are. They mostly seem like carpooling-style arrangements for locals who work in Boracay; that means we only get to go there in the evening and come back before 7 am. We’re hoping to find less-crowded kitesurfing, maybe some diving, good food, and other exploring adventures. Wish us luck!